The incidence of liver injury is continuously rising due to increase in the incidence of road traffic accidents usually as a part of poly-trauma. Mortality of liver trauma has considerably decreased due to improvement in the diagnostic and therapeutic strategy of such patients with current mortality fluctuating around 10% depending upon type and grade of injury. Over the last several decades, non-operative management (NOM) of blunt hepatic injuries has been demonstrated, in selective patients, to be both safe and highly successful. Many studies have confirmed that 80-90% of all blunt liver injuries may be managed without laparotomy. ,, From the 1990s onwards in the emergency room of trauma centers, before a CT evaluation, surgeons or emergency physicians have routinely been performing focused assessment sonography for trauma (FAST) in the recognition of the presence of intra-abdominal free fluid. , Regardless of the initial ultrasonography (US) result, repeated sonographic examination could be performed in patients who were initially managed non-operatively, to monitor quantitative changes in fluid collection or detect new findings not initially detected. The selection of further appropriate imaging studies, after initial and indispensable CT evaluation, may be institution- or physician-specific, as expert interpretation is, perhaps, the most important factor in deciding which imaging study to employ. The appropriate approach should be determined by local resources, expertise, clinical conditions, and, furthermore, by instrumental location. Restriction of physical activities has been recommended by several authorities in an attempt to prevent complications. However no clear guidelines exist regarding the time frame for these restrictions or follow-up scans. Even Richardson shares the same opinion in a recent discussion at the American College of Surgeons' 90 th Annual Clinical Congress, New Orleans, LA, October 2004. He pointed out that there are numerous unresolved questions about liver and spleen non-operative management (NOM), in particular ''in the role of follow-up scans.'' Keeping in view the underlying trauma of a soft organ, it seems logical to restrict strenuous activity for 5-6 months, even though the recommendation is not supported by any sound clinical date''. So it becomes imperative to emphasize on young people to avoid any strenuous work for at least 5-6 months who invariably are impatient to resume their strenuous physical activity. This common recommendation is given in order to safeguard them against re-injury, which might, arguably, have a higher failure rate with NOM. There is, however little data available which could nicely explain the time taken by the injured liver to undergo the reparative process. As a matter of fact, the knowledge of the healing time of blunt hepatic injuries is based on presumptive time of scar development ascertained in a few young patients or animal models. , The initial report on conservative management of blunt liver injury in four pediatric patients was published in 1972 by Richie  and others. Since then several other published studies have supported this approach, which has become the treatment of choice for stable patients of all ages with blunt liver injury. The purpose of study was to evaluate the role of non-operative management of liver injury due to blunt abdominal trauma. Palpation would reveal a soft abdomen with no tenderness or rebound tenderness in any quadrant. The absence of any intraperitoneal or retroperitoneal injuries on computerized axial tomography scans requiring operative intervention. All patients with liver injury from blunt trauma abdomen between 1 st January 2000 and 1 st January 2010, who were selected for non-operative management were studied. Ethical committee clearance was obtained from the local review board and informed consent was taken from every patient. A total of 198 patients presented with liver injury due to blunt abdominal trauma. Of these 152 were put on conservative management. Patients were thoroughly examined in the Accident and Emergency Department of our institute. Hundred and three (67.77%) patients were males and 49 (32.23%) were females. Age range was 15 to 60 years (32.8 years mean). Most of the injuries were because of road traffic accidents 124/152 (81.57%) [Table 1]. Most of them were passengers not wearing seat belt 98/124 (79.03%). Twelve (9.67%) patients were drivers and 14 (11.29%) were pedestrians. Patients who were unstable hemodynamically on admission were excluded from study. All of these patients (46 in number) had other associated visceral injury on laparotomy. Patients were subjected to thorough evaluation according to Advanced Trauma Life Support guidelines. All patients underwent abdominal ultrasonography immediately after admission. 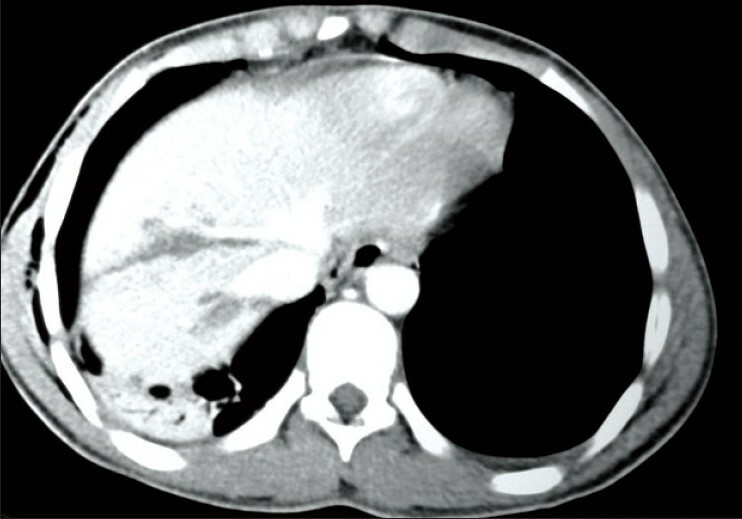 Hemodynamically stable patients were subjected to computed tomography with I/V contrast enhancement immediately after ultrasonography [Figure 1],[Figure 2],[Figure 3],[Figure 4]. Patients were categorized into different grades of injury according to Moore's grades [Table 2]. Baseline investigations like hemogram, kidney function test, liver function test, X-ray chest, cervical spine and pelvis were done. Patients were subjected to intensive hemodynamic monitoring for first 48 h in surgical intensive care. They were kept on intravenous fluids as per central venous pressure and antibiotics empirically (third-generation cephalosporin). Serial hemoglobin and hematocrit levels were measured every 24 h. Repeated abdominal assessment was done by clinical and ultrasonic means. Most of the patients (103; 67.77%) were young males. Mean age was 32.8 years. Physical examination picked pallor in 10.52% of the patient . 51.31% of the patients had unremarkable abdominal examination. Liver function was normal in all patients. Most of the patients had an injury severity score between 10 and 30. There were 30 patients with grade I injury, 63 with grade II, 26 with grade III and 33 with grade IV injury [Table 3]. All patients underwent intensive hemodynamic monitoring in intensive care unit (ICU). Average ICU stay was two days and range was 1-5 days. ICU stay was more for Grade IV injuries. Associated injuries were present in 81 patients. Head injury was the most common associated injury followed by skeletal injury and chest injury [Table 4]. Blood transfusion was given in 47 patients. Average unit of blood transfused was 1.6 units with a range of 1-3. Grade III and IV injury had greater requirement of blood transfusion as compared to Grade I and II. The length of hospital stay was 5 to 17 days with an average of 8.6 days. It was more for Grade III and IV injury. All patients received a third-generation cephalosporin initially empirically. Blood culture was done in patients who developed fever any time during their stay in hospital. Antibiotic was changed in these patients as per culture sensitivity. There was no mortality in our series. Eight patients needed exploration because they developed hemodynamic instability. Their systolic blood pressure dropped to less than 90 mmHg. All of them were explored within 48 h of injury. In all of them primary repair of liver laceration was done using liver needle and co-opting sutures. They were again shifted to ICU for hemodynamic monitoring. Two of them had Grade III and six had Grade IV injury. All of them survived. Four of the patients developed postoperative liver abscess. Two of them were treated with broad spectrum antibiotics and two with ultrasound-guided catheter drainage. There has been a significant shift from operative to non-operative management of liver injuries in the past two decades. This significant shift towards non-operative management was because of high precision of diagnostic algorithm given by ultrasonography, computed tomography, angiography (CTA, MRA). , As a result of these diagnostic modalities and availability of critical care units, management of liver injuries has shifted from operative to non-operative means. We favored conservative management in hemodynamiccaly stable patients with no peritoneal signs, no other associated abdominal injury requiring laparotomy. Karp et al. presented one of the first studies with a long-term follow-up after liver injury and NOM. In their study, a series of 17 pediatric liver injuries managed non-operatively was presented. Patients had repeated CT scans at 12-14 days, 6 weeks, 2 months, and 4 months after their injury. Amroch et al. described 13 children with blunt liver injuries managed non-operatively who had follow-up US and/or CT every 24 h until stabilization. The most appropriate time for documenting the resolution of liver injuries with CT in children has been suggested to be 3 months for mild injuries, 3-6 months for moderate injuries, and 9 months for the most severe injuries. The author, however, suggests the necessity of restrictions of full activities until a CT examination shows complete healing. In 1990, Dulchavsky et al. investigated liver healing in both canine and porcine models, and they found that hepatic repair by secondary intention is rapid and complete. However, this model was a surgical transverse incision made with a Smith single-edge razor. Since then, some articles have discussed follow-up imaging studies and many authors have questioned the need for routine CT or US follow-up. Cuff et al.,Navarro et al., and Mizzi et al. 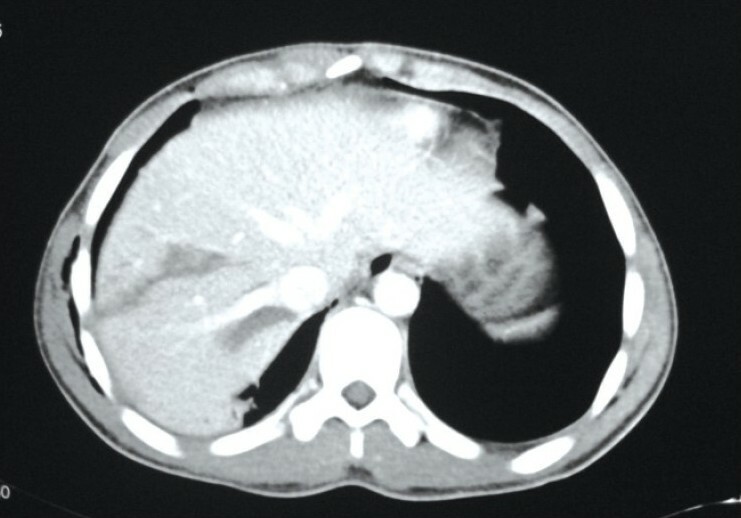 all retrospectively studied CT and US in both adults and children with blunt hepatic injury. ,, They stated that follow-up imaging does not contribute to the final outcome and that, with an asymptomatic patient, either US or CT does not provide additional information. 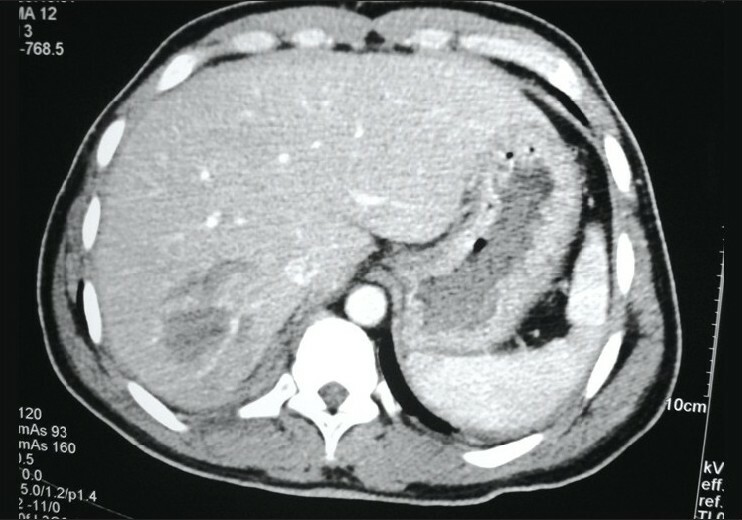 A known disadvantage of non-operative management of liver trauma is possibility of missing an associated intra-abdominal injury with a reported incidence of 3%. 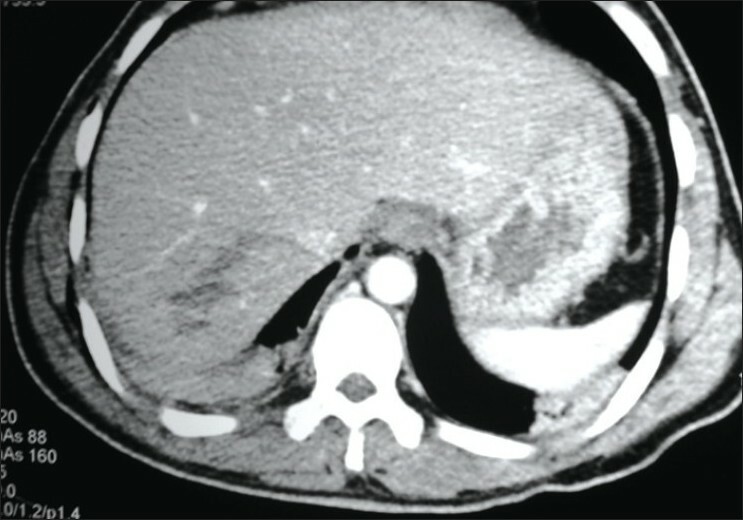 Another disadvantage of conservative management is the development of peri-hepatic abscess which can be safely managed by percutaneous drainage or conservative treatment. Based on this study we recommend that non-operative management of liver trauma is safe and effective method of management in hemodynamically stable patients with grade I to IV liver trauma. 1. MacKenzie S, Kortbeek JB, Mulloy R, Hameed SM. Recent experience with multidisciplinary approach to complex hepatic trauma. Injury 2004;35:869-77. 2. Richardson JD. Changes in the management of injuries to the liver and spleen. J Am Coll Surg 2005;200:648-69. 3. Pachter HL, Liang HG, Hofstetter SR. Liver and biliary tract trauma. In: Mattox KL, Feliciano DV, Moore EE, editors. Trauma. New York: McGraw-Hill; 2000.p.633-67. 4. Cuff RF, Cogbill TH, Lambert PJ. Nonoperative management of blunt liver trauma: The value of follow-up abdominal computed tomography scans. Am Surg 2000;66:332-6. 5. McKenney MG, Martin L, Lentz K, Lopez C, Sleeman D, Aristide G, et al. 1,000 consecutive ultrasounds for blunt abdominal trauma. J Trauma 1996;40:607-10. 6. Rozycki GS, Dente CJ. Surgeon-performed ultrasound in trauma and surgical critical care. In: Moore EE, Feliciano DV, Mattox KL editors. Trauma. New York: McGraw-Hill; 2004.p.311-28. 7. Scalea T. Diagnostic imaging in the trauma patient. In: Moore EE, Mattox KL, Feliciano DV editors. Trauma manual. New York: McGraw-Hill; 2003.p.99-107. 8. Karp MP, Cooney DR, Pros GA, Newman BM, Jewett TC Jr. The nonoperative management of pediatric hepatic trauma. J Pediatric Surg 1983;18:512. 9. Dulchavsky SA, Lucas CE, Ledgerwood AM, Grabow D, An T. Efficacy of liver wound healing by secondary intent. J Trauma 1990;30:44-8. 10. Richie JP, Fonkalsrud EW. Subcapsular hematoma of the liver: Nonoperative management Arch Surg 1972;104:781-4. 11. Vyhnanek F, Denemark L, Duchac V. Basic diagnostic and therapeutic principles of liver injury. Acta Chir Orthop Traumatol Czech 2003;70:219-25. 12. Poletti PA, Mirvis SE, Shammuganathan K, Killeen KL, Coldwell D. CT criteria for management of blunt liver trauma: Correlation with angiography and surgical findings. Radiology 2000;216:418-27. 13. Simanek V, Skalicky T, Treska V, K Lecka, Mirka H, Ohlidalova K. Liver injuries case reports. Urazova Chirurgie 2004;12:17-22. 14. Dominguez FE, Aufmkolk M, Schmidt U, Nimitz k. Outcome and management of blunt liver injuries in multiple trauma patients. Langenbecks Arch Surg 1999;384:53-460. 15. Amroch D, Schiavon G, Carmignola G, Zoppellaro F, Marzaro M, Berton F, et al. Isolated blunt liver trauma: Is nonoperative treatment justified? J Pediatr Surg 1992;27:466-8. 16. Navarro O, Babyn PS, Pearl RH. The value of routine follow-up imaging in pediatric blunt liver trauma. Pediatr Radiol 2000;30:546-50. 17. Mizzi A, Shabani A, Watt A. The role of follow-up imaging in paediatric blunt abdominal trauma. Clin Radiol 2002;57:908-12. 18. Pachter HL, Knudson MM, Esng B, Ross S, Hoyt D, Cogbill T, et al. Status of nonoperative management of blunt hepatic injuries in 1995: A multicenter experience with 404 patients. J Trauma 1996;40:31-8. 19. Pachter HL, Hofstetter SR. The current status of nonoperative management of hepatic injury. Am J Surg 1995;169:442-54. 20. Pachter HL, Spencer FC, Hofstetter SR, Liang HG, Coppa GF. Significant trends in the treatment of Hepatic Trauma: Experience with 411 injuries. Ann Surg 1992;215:492-502. 21. Sherman HF, Savage BA, Jones LM. Nonoperative management of blunt hepatic injuries: Safe at any grade? J Trauma 1994;37:616-21. 22. Meredith JW, Young JS, Bowling J, Roboussin D. Nonoperative management of blunt hepatic trauma: The exception or the rule? J Trauma 1994;36;529-35. 23. Boone DC, Federle M, Billiar TR, Udekwu AO, Peitzman AB. 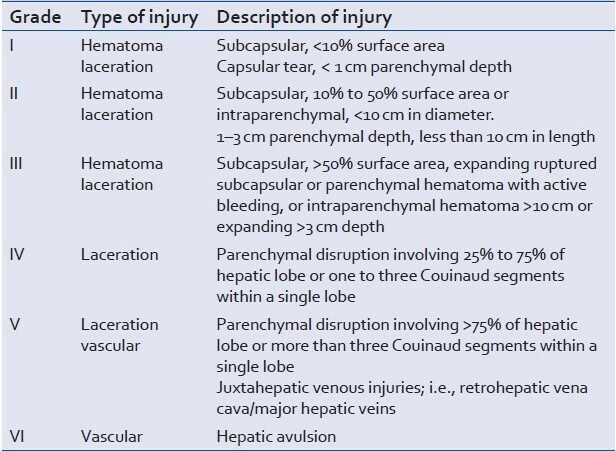 Evolution of management of major hepatic trauma: Identification of patterns of injury. J Trauma 1995;39:344-50. 24. Miller PR, Croce MA, Bee TK, Malhotra AK, Fabian TC. Associated injuries in blunt solid organ trauma: Implications for missed injury in nonoperative management. J Trauma 2002;53:238-42. Swift, C. and Garner, J.P.